Track Monk Seals in Hawaii with Our New Collaborating Partner! Signals of Spring is thrilled to announce our newest partnership with the Hawaiian Monk Seal Research Program, part of NOAA’s Pacific Islands Fisheries Science Center. 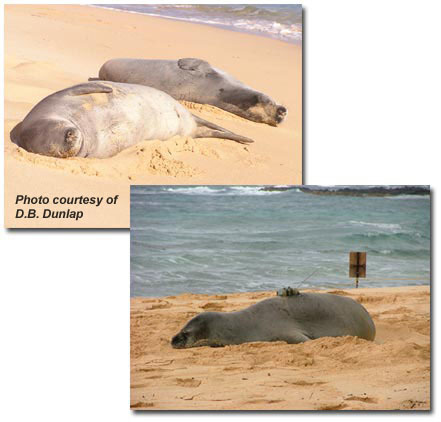 Students can now track monk seals, an Endangered Species native to the Hawaiian Islands. This project will be particularly interesting because scientists and students will be learning together! There are two major regions of the Hawaiian Archipelago where monk seals reside. One is the main islands of Hawaii and the other is the remote Northwestern Hawaiian Islands. Scientists have been studying the monk seals in the northwestern area extensively for nearly 30 years, because that’s where the vast majority of the species lives. The studies have shown that the number of seals has seriously declined since the late 1950’s, and is declining again in recent years. The juvenile mortality rate is high, with a significant percentage of pups dying before their third birthday. At the same time, a smaller population of the seals on the main islands are thriving. They are healthy and plump. So, scientists are trying to find out why the populations are so drastically different. To accomplish this task, the scientists will study many factors, and particularly the foraging and feeding behaviors of these animals. Using the satellite tags, they can see exactly where the seals go to eat. Monk seals are not picky eaters, choosing many types of fish, crustaceans such as lobster, and cephalopods like octopus and squid, that they find on the bottom. These seals can dive to more than 500 meters deep to find something to eat. Preliminary results hint at some feeding differences in the two populations. For example, some animals in the Northwest population tend to go far away to forage, routinely swimming 100 miles away to catch a meal. The main island seals, on the other hand, may be staying close to home and finding their food locally. Signals of Spring students who decide to study these seals should look at their movements, determining how close they stay to the island as well as the bathymetry in the area. Another course of study is to examine the potential threats to this main island population. Both populations of monk seals face similar threats including entanglement, shark predation, and natural mortality. However, the main island population must deal with more human interaction. Unlike the northwest islands, which are mostly off limits to people except for scientists, there are lots of humans on the main islands. As Charles Littnan, Research Ecologist for the Hawaiian Monk Seal Research Program explained, “There is a lot of human/seal interaction.” Monk seals “haul out” onto the beach to rest, putting them in direct contact with both resident Hawaiians and tourists. Unfortunately, this interaction puts the seals at risk for disease, bites from dogs, and well-meaning humans who try to feed or ‘wake up’ the seals. Relaxing on the beach is a natural behavior for these seals, and it is best to leave them alone! Other potential threats to these main island seals are agricultural runoff, which may include disease-causing bacteria, exposure to other animal disease, and becoming hooked in fishing gear. Near the main islands, monk seals swim in waters that are important recreation and fishing areas for humans, putting them at risk for various dangers. Because there are so many potential threats to the Hawaiian Monk Seals, and only about 1300 individuals, Dr. Littnan stresses that we must educate others about these animals, and learn more about their behaviors. Students and scientists will work together this spring to accomplish both of these tasks!